If you love a touch of glamour but donâ€™t want to splash your cash, I recommend taking a look at zircon gold belly bars. Zircon gold is a gorgeous type of gold-coloured titanium, so it looks just like real gold but is much cheaper. It also has the same comfortable feel as regular titanium, so you can have a comfy, glamorous gold belly bar for just Â£6.95. 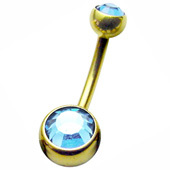 Zircon gold belly bars look fabulous against your skin and come in lots of different styles. They are a great way to get a glamorous look for less and are great for the health of your piercing. Zircon gold is extremely biocompatible, light and durable, so it feels amazing even in sensitive piercings. Jewelled belly bars always look fab and jewelled zircon gold belly bars are no exception. You can get zircon gold belly bars in a great choice of jewelled designs, from single jewels to gorgeous colours and elaborate jewel-encrusted designs. They look really glamorous and are perfect for a special occasion. This entry was posted in Belly (Navel) Piercings, Navel Bananabells, Zircon Gold Body Jewellery and tagged Belly Bar, Belly Bar Jewellery, Belly Bars, Cute Belly Bars on September 4, 2010 by Piercing Guru.